In this interview with artist Jef Murray, the translation was made by Sergio Ramos. Jef is is a regular contributor to the the Tolkien Brazil site on various topics, so it is a joy for us to publish this interview. 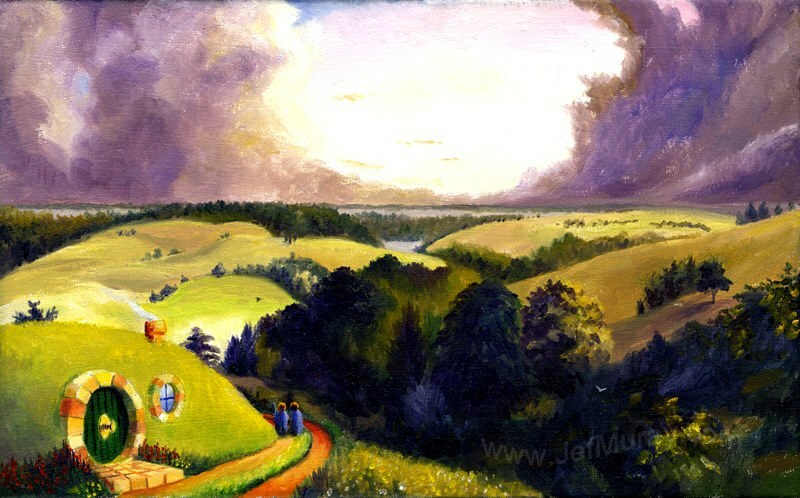 Jef Murray (www.jefmurray.com) is an artist, author and internationally known illustrator. His paintings, drawings and writings appear in fantasy publications and cultural journals worldwide. His artwork has been featured in calendars, on websites, in video courses and television specials on J.R.R. Tolkien, and in logo and book cover designs. His paintings and drawings have been exhibited in the United States, Canada, the United Kingdom, and the Netherlands. His first book of short stories, poetry and weights, Seer: A Wizard’s Journal (was published by Oloris Publishing in 2012 – See more at: http://tolkienbrasil.com/artigos/entrevistas/entrevista-com-o-ilustrador-jef-murray/#sthash.SQsANPEx.dpuf and at www.OlorisPublishing.com. I was born in Melbourne, Florida, in the USA, but lived much of my childhood in northern Georgia, in the foothills of the Appalachian Mountains. These are, BTW, the oldest mountains on earth, and they still hold many mysteries; I feel very blessed to have been raised in such a wild place! When did you begin to paint? I first took “serious” studio art classes when in college, but had to do so secretly. Art classes weren’t even called that at the Georgia Institute of Technology; they were called “visual communications” courses. And I was one of the few non-architects to take them. But, even in my engineering days, I drew and sketched, did pen and ink work, and created company logos. 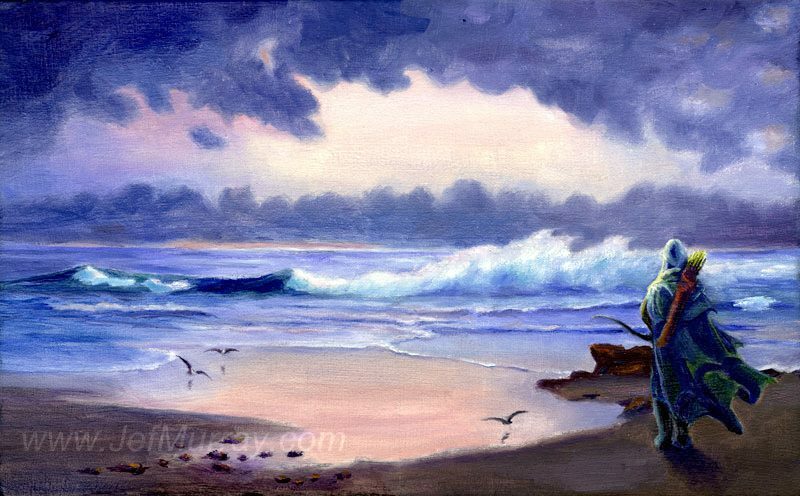 I only began to paint in the mid-1980s, when I attended oil painting studio classes at the Atlanta College of Art (now the Savannah College of Art and Design). And I continued painting from that point forward, but I only started doing so professionally beginning in 1999. When did you first come to know the works of Tolkien? I first recollect being read The Hobbit by my mum when I was in 2nd grade. She recited one chapter per night to me and my younger brother as a bedtime story, along with chapters from the Narnia tales; and I’ve ever since conflated the two in that enchanted and mysterious realm of childhood glamour that is remembrance. We were also told at the time that there was a sequel to The Hobbit, but that we were not yet old enough to read it at bedtime. Happily, in this instance, my mum was quite right; the nightmares that might have ensued had she relented to our protestations would have been epic in proportion! What my childhood imagination might have conjured upon her reading to us about the ring-wraiths, I’d prefer not to reflect upon! But, I did at last tackle The Lord of the Rings in high-school, and like so many others, fell in love with that fuller world that Tolkien created. This was abetted by the fact that my high-school was, as I said, nestled in the foothills of the Appalachian mountains, and to step past the Edge of the Wild, all I had to do was plunge into the heavy woods that surrounded the campus. Nevertheless, I do not feel that I truly began to fully understand and appreciate The Lord of the Rings, nor The Silmarillion, until I came back to both works as an adult. And as with any classic novel, each subsequent reading teaches me a bit more about myself, about the greater world, and about the nature of life and mystery; because at each reading, I approach the texts as a different person. What do you most like in Tolkien s works? 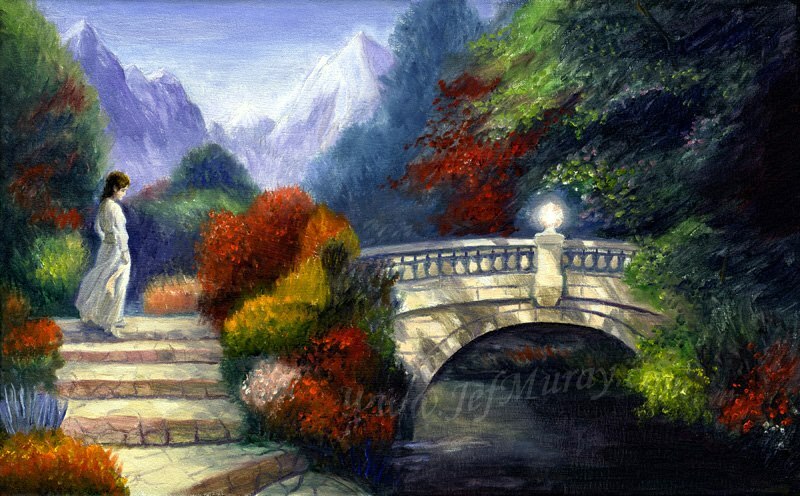 There are too many wondrous places and people in Tolkien’s legendarium for me to give an adequate answer, so let me turn your question on its head and suggest scenes that do not inspire me. Throughout his writings, Tolkien takes the point of view of free folk who choose to withstand and overcome wickedness, the will to power, and hatred, rather than taking the perspective of evil’s allies. We typically only get “into the head” of the corrupt and degraded characters (Morgoth, Sauron, the Witch King, Smaug, Saruman, the orcs, etc.) through the experiences, insights and counsels of the Wise; and even in these cases, it is clear that they are expressing their best sense of how the Enemy operates rather than intimate personal understanding of evil’s workings. So, Tolkien takes the stance that I believe all of us should take; that is, of decent, though fallible, people struggling against evil. He does not wallow in horrible scenes and images, though horrible events are certainly depicted in his writings. Rather, he dwells on hope, on perseverance, on faith, on honour, and on love. As a result of Tolkien’s own stance, I have rarely painted or sketched a scene from Middle-earth that was deliberately ugly, or dark, or that I intended should in any way glorify or honour the power or the triumph of evil. I wish to follow Tolkien in highlighting light, and life, and the deeply-felt longing we all have for the good, the true, and the beautiful. And, as I’ve said, Tolkien’s tales are suffused with scenes that allow an artist to render such things: autumnal forests and sparkling morning mists; the rolling Shire hills; the sweeping plains of Rohan; the craggy peaks of the Misty Mountains; the beauty of the Fair Folk and their dwelling places; the valour of the Dunedain; the poignancy of resolute struggle against overwhelming odds; the peace that comes with acknowledgement of weakness and of the need for the help of a greater Providence. These were the things that were important to Tolkien, and they are the things that are important to me as an artist. What do you think of Peter Jackson movies? There are many, many things that Jackson and the other writers and artists who contributed to his version of The Lord of the Rings and The Hobbit that were fantastic and filled with magic. But, there were just as many other things, to my mind, that were horrid. Some aspects of the original noble tales seem to have been dumbed down, sensationalized, and sometimes just muddled. 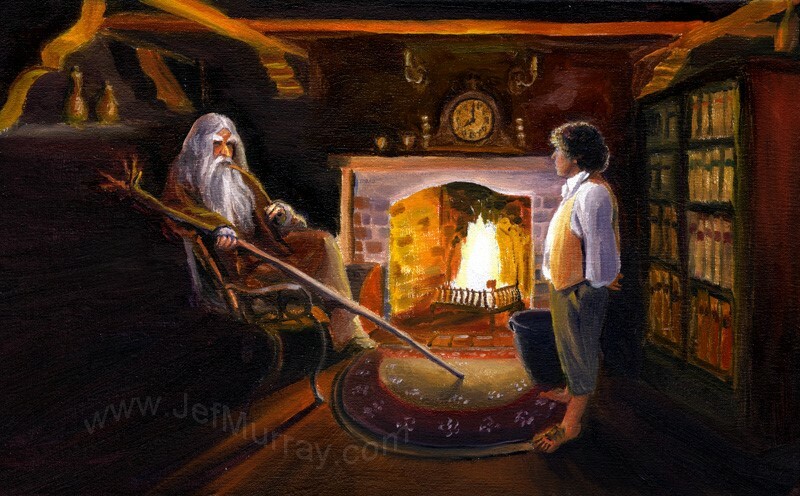 Of course, we can’t judge The Hobbit fully yet, as we’ve only seen the first two installments, but those installments don’t, to my mind, bode well for the beloved childhood tale so many of us grew up with. As with LOTR, I fear too much license is being taken with the story, and too much emphasis is being given to chase scenes, to battles, and to an obsession with shocking imagery that often borders on glorification of evil, ugliness and horror; and these sometimes to the exclusion of hope, honour, self-sacrifice, loyalty, and so many of the other qualities with which Tolkien deliberately imbued his characters. But, The Hobbit may yet redeem itself – we can only hope and pray! What character of middle earth do you prefer? Again, there’s no simple answer to this question. Tolkien’s characters are very rarely simple; they often exhibit great depths of wisdom, nuance, good humour, vanity, humility, intelligence. They run the gamut from difficult, confused and compromised creatures such as Gollum all the way to very high and wise beings like the Valar. And Tolkien convincingly creates not only multitudes of races, but of great variety within those races, so choosing even a handful of favorites is tough. That said, like most, I am very drawn to Hobbits in particular, because they seem to display the best qualities of good, solid, sensible folk; not high aristocrats, but simple souls with whom you’d love to share a meal and a pint. The other characters that intrigue me are the Istari, the wizards. As incarnate angels, they bridge, in a way, the gulf between fallen mankind and the spirit world, and yet they, too, are vulnerable to corruption and deceit. A particular favorite character of mine, and one barely mentioned in Tolkien’s works, is Alatar, one of the Blue Wizards that “went east”. I am always intrigued when Tolkien leaves it to the reader to ask questions about characters that he himself has deliberately left open. Who were the Blue Wizards? Why did they travel east, and why did they not, seemingly, help with the battle against Sauron? We don’t know, but it is fun to speculate; and I’ve done so myself in some of my short stories. 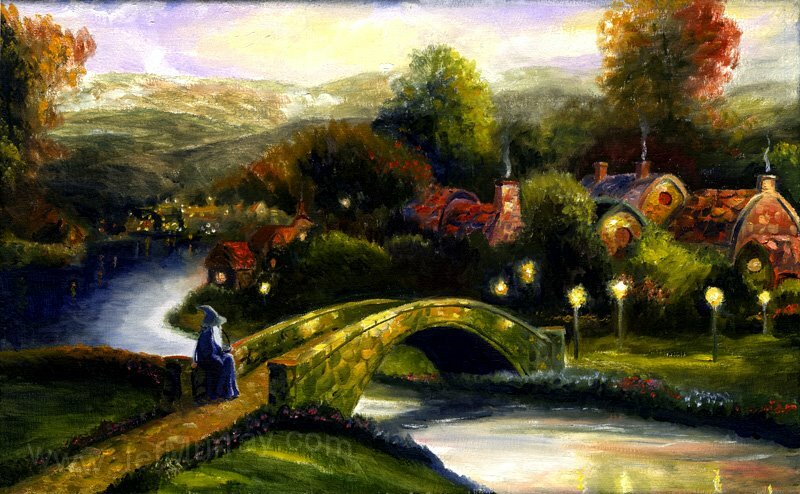 Do you paint only Tolkien? All art is exploration, and there are fewer worlds more delightful to explore than Tolkien’s. And that is precisely what one does when one paints; you are offered the opportunity to imagine what a place or a person might have looked like. And, as you proceed, you often get the sense not so much of “making things up” as in discovering them for the first time – “seeing” them as they must have actually been.